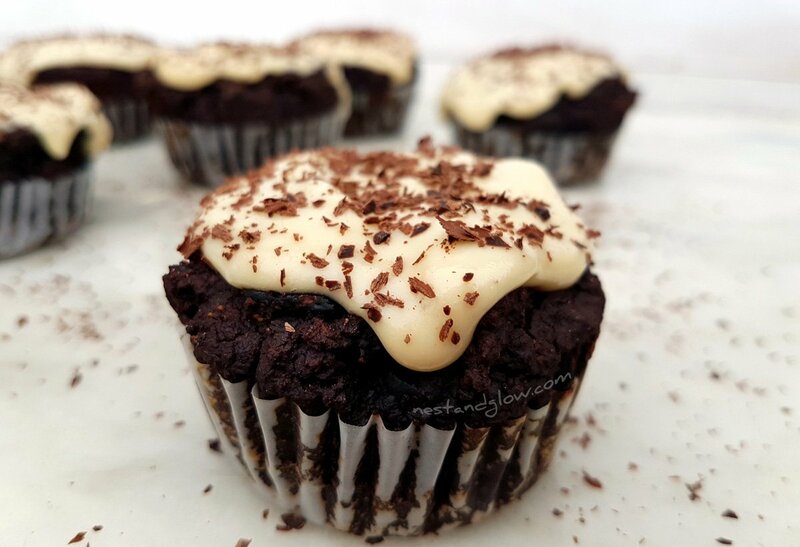 These healthy vegan Black Bean Chocolate Fudge Muffins with Vanilla Frosting have no flour, eggs or butter and are 100% plant based. The recipe is very simple and even if you’re not good at baking, like me, it’s hard to go wrong with making these. If you are testing these black bean muffins on others don’t tell them the special ingredient until after they have tried them. No one in real life has guessed the secret ingredient and everyone was unaware that they are healthy muffins loaded with nutrients, vitamins, fibre, protein and heart-healthy fats. 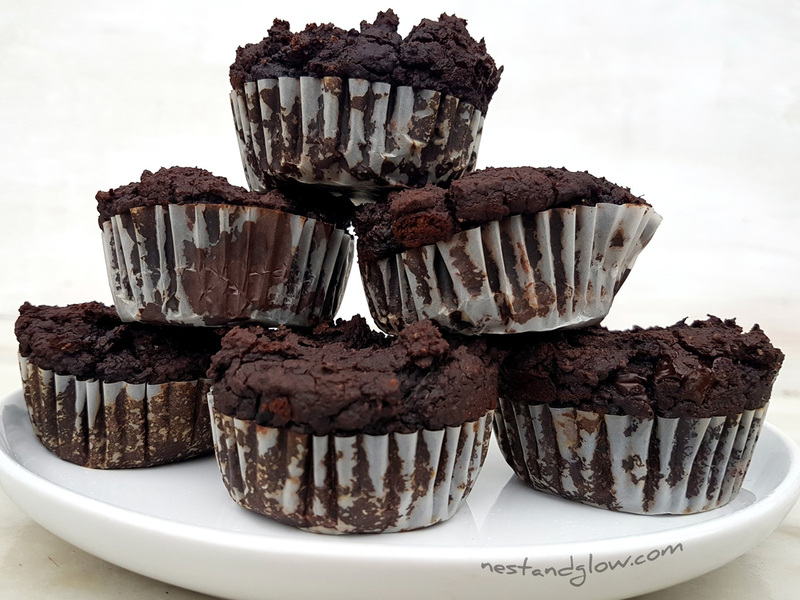 Out of all the recipes I’ve posted on Nest and Glow this chocolate muffin is my favourite. This chocolate muffin recipe I always reach for if I want to make someone an impressive delicious cake that tastes like it’s bad for you when actually it’s loaded with nutrition. Suitable for people on a gluten-free, vegan, plant based and general healthy whole foods diet. These muffins may be high in calories, but one will satisfy a sweet tooth as they are made from whole foods. To make a healthier version you can leave out the coconut oil and chocolate chips. They will still taste great, but won’t quite have the same fudgy texture. I usually don’t eat cooked oil of any sort, but a tiny bit of coconut oil once in a while is fine. 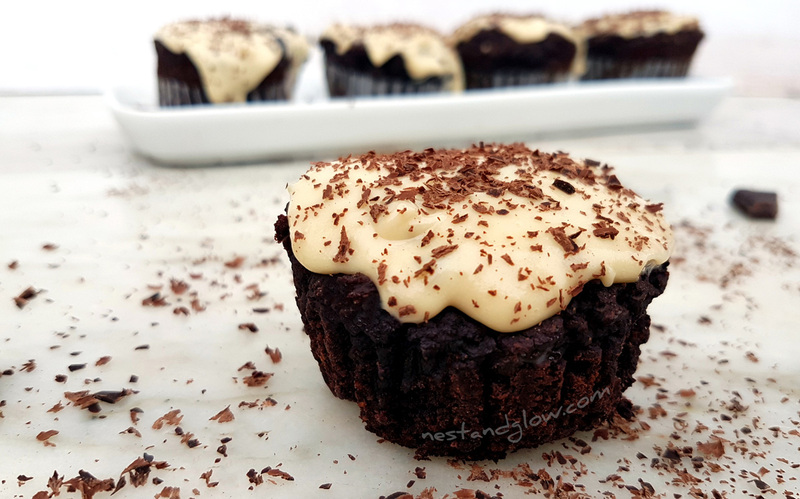 If you prefer you can make this recipe without the vanilla bean cashew frosting and they are still delicious. The most common question I get about these healthy chocolate muffins is if they taste of beans, and the answer is no! They really don’t even if you are looking for the beany flavour the cocoa and sweetness makes the healthy ingredient undetectable. For the chocolate chips I slice up a very dark bar of chocolate. The higher the cocoa the better – I aim for something 80-85% cocoa. The bar I used for this healthy muffin recipe is 82%. Just make sure you use a vegan chocolate if you are not eating dairy. Black beans are also known as turtle beans due to their hard shell-like appearance, They are one of the best beans to strengthen your bones as they contain calcium, iron, phosphorus, copper, magnesium, manganese and zinc. Preheat the oven to 350 F / 180 C.
Place everything for the bean muffins apart from the chocolate chips / chunks in a food processor and blend until smooth. You can use a blender if you don’t have a food processor but it will need to be blended in batches. Stir in the ½ cup / 80g of chocolate chips and then spread out in a lined muffin pan. Bake in the oven for 16-20 mins until a knife comes out clean. Blend all the cashew frosting ingredients together then place in the freezer for 5 mins. It should then be a consistency where it doesn’t pour but is still spreadable. If the frosting is too runny, stir in some more melted coconut oil and chill. Spread frosting on top of the black bean muffins. Garnish with some chocolate shavings. They are delicious while warm and gooey but still taste amazing cold and these healthy chocolate muffins will last a few days in the fridge. I made these but they didn’t rise very much & the mixture was quite stiff? Is this correct? Hi Chris, the mixture is quite stiff for these and there is only a small rise once they have cooled down. However, as the recipes here are full of natural ingredients they can need a bit of tweaking as these can vary so much. Did it taste good? What’s considered a “tin” of blackbeans ? How do I figure out 240g of black beans ? Do I just weigh them out prior to soaking ? I made these using mini muffin cups so they were 2 bite size. Perfect for when you want something sweet. Good woth and without the cashew icing. Mind blowing good! Hi there, I use raw for this – no need to heat the cashews for them to be yummy!